Also see our Tips on How to Get Pregnant with Irregular Cycles. It’s not uncommon for similar requests to land in my inbox. Tips and shortcuts on getting pregnant as fast as we can, is what many of my clients over the years have initially been looking for. Especially when an expert told them that their low AMH or High FSH, recurrent miscarriages or luteinized unruptured follicle syndrome meant that they only had a handful of good eggs left. 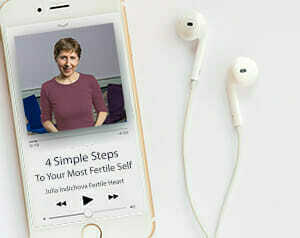 Yes, in my fertility counseling practice I have certainly seen one “aha moment” of profound emotionally charged insight, become the fertility drug that accomplished more than several IVF treatments. (Or allowed that next IVF to work after years of heartache.) The child that was inconceivable yesterday became conceivable and conceived today. That sweet little boy in the photo with his lovely smiling mom? 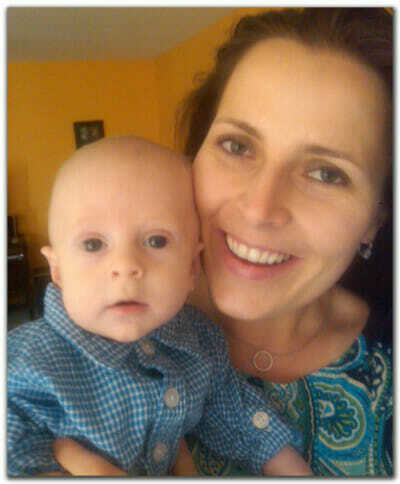 That’s Janka with her baby boy. She shared with me (and allowed me to share with you) that he was conceived naturally the night after the workshop after two failed IVF’s. The first time his Mom and Dad registered for the workshop, their seats in the circle remained empty. Why? Because after their first failed IVF their doctor urged them to schedule their next IVF immediately, and get pregnant fast. He told them they were running out of time. So instead of coming to Woodstock or learning about the Fertile Heart OVUM tools on the teleconference calls they rushed into their next IVF which also ended up failing. Coming to the workshop their expectations were pretty low. They certainly didn’t expect an instant infertility cure that would get them pregnant fast. And yet, something happened in those seven hours of playing the I.B.O.W. game that allowed them to cross over into the land of possibility. Having shared that story, I must also add a gentle warning for anyone looking to get pregnant fast thinking they’re running out of time. When attending to infertility or other health issues, a fast solution often ends up being a a superficial solution. Not only does it fail to bring us a baby, it may create a setback. The stimulants that were meant to boost our ovulation end up throwing our hormones off balance and we’re back to square one. Whatever you choose to do to heal your irregular cycles might indeed lead to getting pregnant fast. But when someone tells you they have a sure-fire quick fix that will instantly balance your hormones and deliver the baby in the next shipment of newborns, , stop and take a nice deep breath. Then check in with your wiser self and be sure it’s not panic that drives your next decision. In response to the many request for guidance with irregular periods, I have also compiled a list of specific physical and emotional issues that can affect hormone balance and your menstrual cycles. In the Tips for Getting Pregnant with Irregular Cycles, I also offer tips on how to heal those issues and yes! how to get pregnant with irregular cycles. Sometimes it will happen faster than you expected and sometimes, your daughter, like mine, will give you a little more time to learn to love yourself before she shows up.